After 24hrs on the ferry, and an overnight stop in the car park of a wildlife park near Santander (complete with elephants! ) we woke to dazzling sunshine and a light frost. Time to head to the crag! About 400 routes set alongside a meandering river – some just a minute from the car. 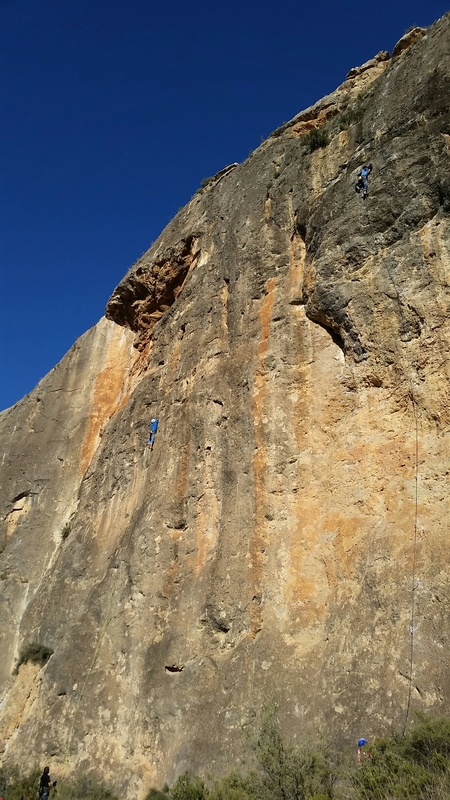 A friendly group of Spanish Sunday climbers, but otherwise deserted. The climbing is great – or at least the 4 routes we squeezed in. Generally sharp pockety rock with a broad range of grades. Definitely one to come back to. Then back on the road for another 250km and a campsite near Valencia. Tucked up just 2 hours from the Costa Blanca with 4 routes under the belt and only 36hrs since leaving Portsmouth.